Help needed to confirm if these are indeed whitefly larvae and what I can do. It's October (going into winter here) so I brought my herbs indoors a few weeks ago, only to have this pest. Questions: 1. Can anything be done to remove the white spots from the leaves? I think this is the larvae. Right now I've moved the herbs back outside and the whiteflies have disappeared (too cold), but as it's currently 45-55 F here (7-12 C), I'm worried how long my plants (esp basil and parsley) will last. Can I eat the parsley with the white dots? Even with aggressive spraying, vacuuming the leaves, and scrubbing with water, I can't remove them. I doubt they're harmful, but not very palatable. I'm seriously considering chopping off the parsley early for the winter to end this pest. Will these spread to other herbs? There's also snow-like shedding in the soil. So far, these have not spread to my other herbs beside it (basil, rosemary, thyme, mint, chives). 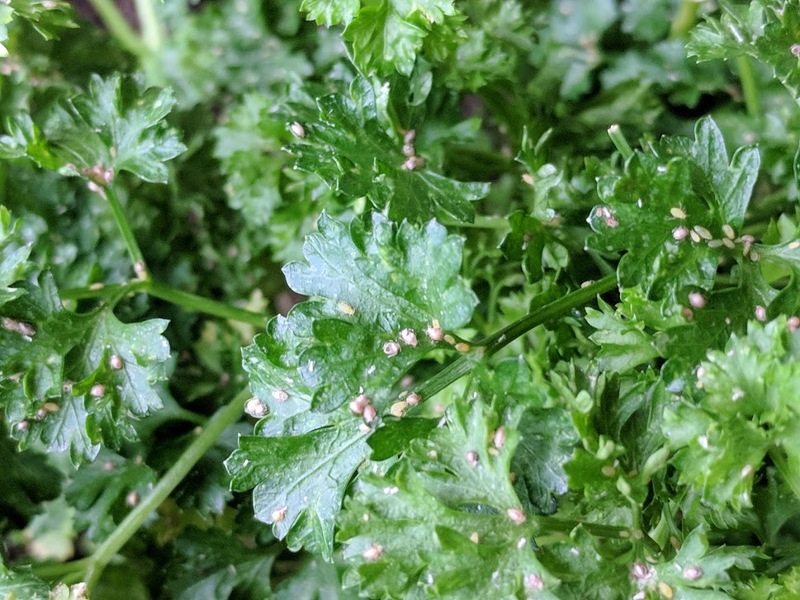 Are any of these others significantly at risk, or just parsley? 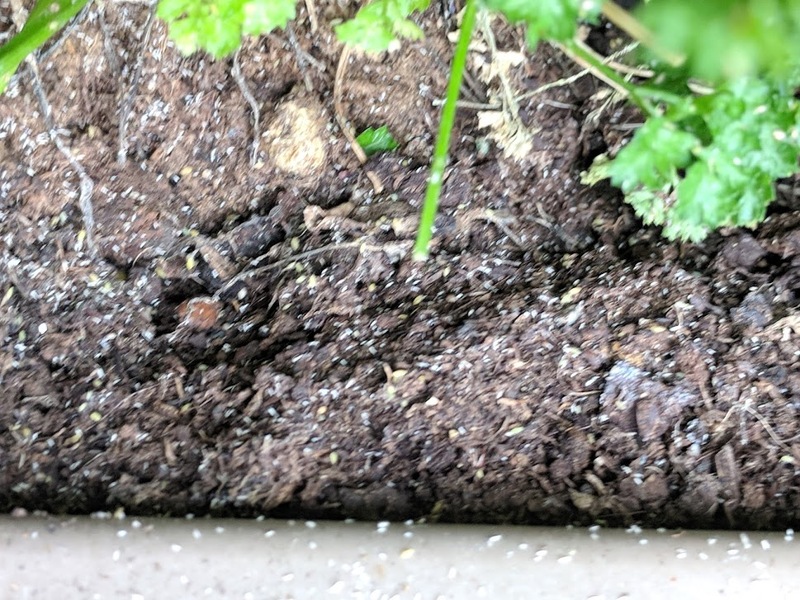 Should I trash the soil (these are in pots) completely rather than risk larvae next season? Please share if you can help. It's certainly a heavy and probably longstanding infestation of some type of whitefly by the looks of it, but that's quite unusual on plants growing outdoors which aren't brassicas in the UK and Ireland. If its whitefly,they usually fly up in the air when you wave your hand near the plant - these insects don't look exactly like typical whitefly either, but I see eggs larvae and adults in the photo. Regardless, you can try spraying with a pyrethrum based product such as Bug Clear Gun for Fruit and Vegetables, but to be honest, the infestation is so bad I'd recommend digging them up and disposing of the plants. The white marks you could not remove from the leaves are where the aphids have been sucking the sap and caused damage - if there are no insects or eggs on some of the leaves, you could eat them even if they're marked, but I'm not sure anyone would want to. 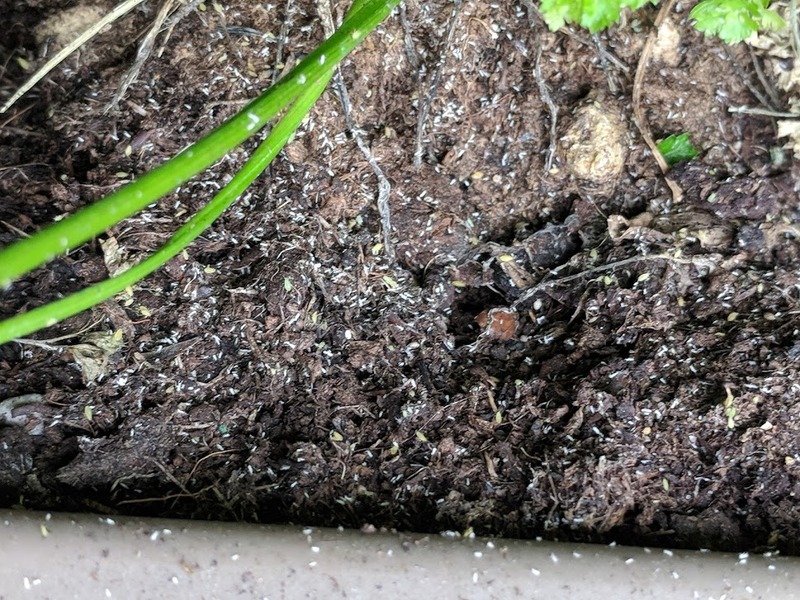 You are right to be worried about cooler temperatures in regard to the Basil, but if it is as heavily infested as the parsley, I'd recommend disposing of that too. If you had any of these plants in the house for longer than a day or two, best to check any other indoor plants you have to make sure they are not now affected by the same problem. Not the answer you're looking for? Browse other questions tagged pest-control herbs basil aphids parsley or ask your own question. How do I get rid of white flies on my basil? My flat leaf parsley has stunted growth and pale red leaves. What could be wrong? 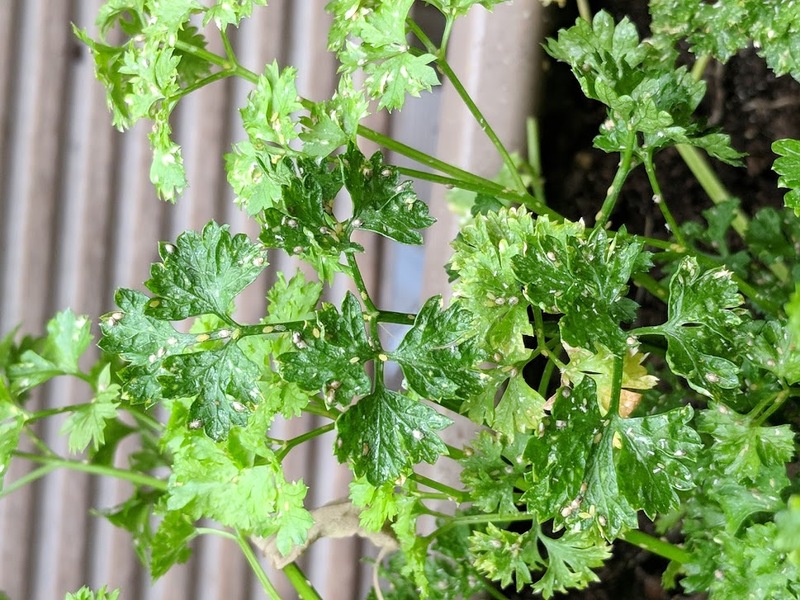 Why do many of my parsley leaves have white tips? Early action needed for whiteflies and aphids? How to prepare herbs for winter? What do I have to pay attention to with pre-potted growing sets of herbs?